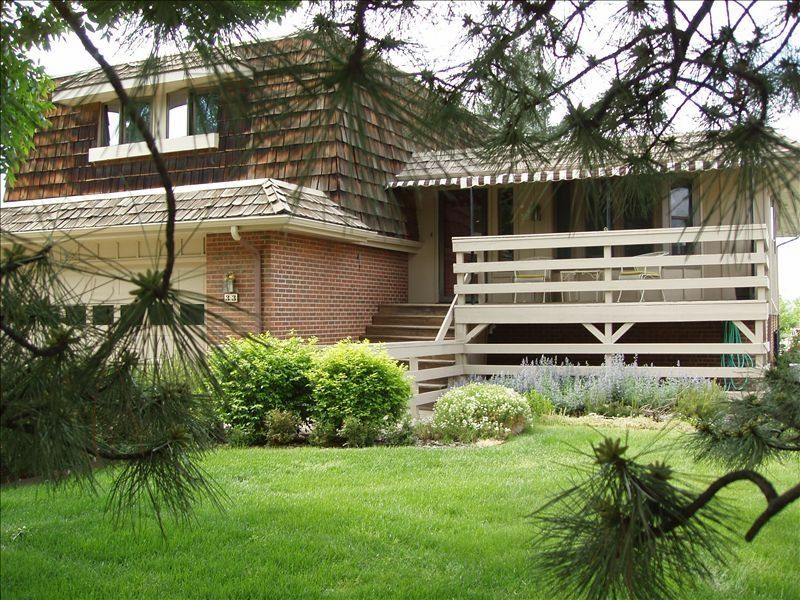 This established property is situated in the exclusive Columbine County Club area just minutes from historic downtown Littleton. This Home is rented only by the month. It is a great interim home for folks moving into the area, folks remodeling an existing home or folks looking for an extended stay in the area. Split Level home includes 4 bedroom, 3 full bathrooms, 2 car garage located on quiet Cul-de-sac. No sofa beds or futons, just real beds for sleeping 10 people. Large brick patio surrounded by mature blue spruce trees perfect for outdoor gatherings. Enjoy the south facing deck in the morning with your morning coffee. Equipped with everything needed for formal events as well as everyday living. This area of the south Denver is rural in nature, yet close to everything. Miles of biking along the scenic Platte River, to Chatfield Reservoir or north to downtown Denver. Several golf courses, equestrian centers, local recreation center and restaurants are nearby... Upscale shopping centers are just a few miles away. 20 minute drive to Downtown Denver, Coors field, Invesco Field. Denver's new light rail system will speed you away to downtown and it is only a 5 minute drive from this delightful home. Easy one hour drive to Colorado's special one of a kind skiing, Rocky Mountain National Park, and numerous recreational opportunities. Best snow in the Rockies this year. Come and enjoy. 2 slice toaster and a toaster oven. Great Place to Stay- Comfortable, Plenty of Room, & Secure Neighborhood! We arrived from the airport with 3 families and 2 children under the age of 5 and-- we had more than enogh space for all 8 of us including the 2 children. The place is well kept in a very secure neighborhood. The owners were very helpful one day when we left for Colorado Springs and forgot to shut the garage door. Once we realized this (and we were over 1 hour away) we called them and they went over to close the G door. They told us not to worry because it was an extremely safe neighborhood. They have everything you need at the house for children, for cooking (including a Gas barbeque grille) , for entertainment (satellite TV) etc.. . If we ever go back to Denver we would definitely stay at this home and Littleton was one of the nicest subburbsin Denver. It is convienetly located near grocery stores, shopping and the typical tourist areas. What activities, attractions and restaurants did you like or dislike near by ? Colorado Springs is a must- several attractions worth visiting there, Red rocks amphitheaterand of course THE COORS BREWERY TOUR! We rented this property for 4 nights for a family reunion. We had 9 adults staying here and it was perfect. Everything was extremely clean. The beds were very comfortable. The layout and the size made it easy to stay here and not feel cramped in anyway. The location was great - nice quiet neighborhood but close to lots of things. We loved the 70's vibe and the hi-fi with the old albums. The deck was great for entertaining. It was wonderful to have a garage to use. We spent time at St. Patricks Brewery which was nice. The only negatives would be the driveway has a dip that if you're not careful, you can scrape your car and maybe have a few kid type cups. But very minor - we would definitely stay again. My family had a great time staying here. The home, located in a very nice neighborhood, is comfortable and attractive and we all felt "at home" there. IT is large and roomy with enough space for everyone to spread out. The only negative was the air conditioning could not be set below 76 degrees and we were there in August when it was hot, otherwise it was great and I would definitely recommend it to friends. Perfect Family home for those with children! My sisters along with our families enjoyed staying here. We spent a week in Denver for a large extended family celebration. Between the 4 of us we have children ranging in ages from 2 to 20. The space was perfect for everyone to spread out. The sleeping arrangements were perfect, beds very comfortable. The house was clean and very centrally located. Grocery stores as well as coffee shops or restaurants were easy to get to. We had everything we needed for making meals at the house as well. We truly enjoyed the house! Great place for multiple families to gather south of Denver. Bedrooms are very spacious with very comfortable beds. Family (TV) room and living room are very large. Amble room in kitchen for all. 15 minute drive from downtown Denver. Light rail within 5 minute drive. Very quiet neighborhood. Owner were very nice. Several family members traveled out to Denver for my daughter's graduation, and we stayed in Mary's House. It was a great house with plenty of room to host a small get-together for family and friends. So much better than a hotel would have been. The bedrooms were spacious, and everything was well stocked. There was a collection of old record albums that we enjoyed listening to on the stereo, and also many old CDs to choose from. The music was mostly from the 50s, so if you want something more current, bring your own music. Chic and Lucy couldn't have been more accommodating. A fun time was had by all! AT THE TIME OF BOOKING A $500.00 DAMAGE DEPOSIT IS DUE. THIS FEE IS REFUNDABLE WITHIN 30 DAYS AFTER YOUR STAY PROVIDED THERE IS NO DAMAGE TO THE PROPERTY.